As the agitating students of the prestigious FTII in Pune got a fresh wave of support, Gopalakrishnan said a memorandum demanding removal of Chouhan, an actor and Bharatiya Janata Party member, signed by 190 people including Bollywood star Vidya Balan, had been sent to President Pranab Mukherjee. The memorandum would also be sent to the prime minister and the minister for information and broadcasting, Gopalakrishnan told reporters in Mumbai. “Our fast is indefinite. The three students – Hiral Savad, Alol Arora and Himanshu Shekhar -- if they are hospitalised, will be replaced by another batch of protesters,” FTII Students’ Association representative Ranjit Nair said in Pune. Union information and broadcasting ministry officials, too, have been informed about the hunger strike by the protesting students, Pathrabe said. 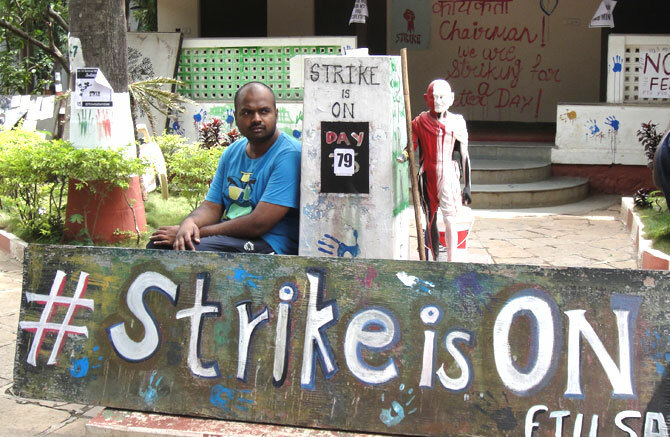 In a letter to the FTII administration, FSA said that while they are seeking “immediate resolution of the present crisis”, the students had no option but to go for the hunger strike because of the government’s “apathy” to the issues raised by them. Union Minister of State for Information and Broadcasting Rajyavardhan Rathore, however, said negotiations with students failed due to an “extremely hardline” stand taken by them. “Unfortunately the students have taken an extremely hardline stand. We are ready to resolve all issues. We have had multiple talks with them,” he told reporters in Panaji. Gopalakrishnan said Chauhan was not qualified enough for the post. “It is important that the chairman of the governing body of FTII is governed by eminent people from different fields like theatre, painting, arts, etc. The current chairman cannot claim to govern the institute because he does not even understand his roles,” he said. “Even others (members of FTII council) have made no contribution to the society. This is a premier film institute, which needs someone who can sail it through difficult days,” said Gopalakrishnan, who himself has been its director before. Further, sending police to the campus to conduct midnight raids only showed that the government intended to “make criminals out of students”, he said. Well-known documentary maker Anand Patwardhan said attempts were being made to saffronise the educational institutions and the only qualification most members of FTII body had was they “belonged to saffron agenda”.